We offer a wide variety of Baby Lock sewing machines including sergers & embroidery machines. For more than 50 years, Baby Lock has been dedicated to the love of sewing by creating machines for sewing, embroidery, quilting and serging – all with ease-of-use, high quality and a touch of elegance. 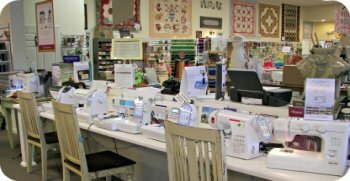 In addition to easy-to-thread sergers and machines for sewers of any level, Baby Lock enhances the love of sewing with an extensive line of sewing supplies including feet, accessories, software and stabilizer. Our staff is very knowledgeable and happy to help you find the perfect fit for your needs. Whether you are a beginner or an expert, we have the right machine for you! All machines come with FREE owner's training classes right here in our shop as well! See our calendar for dates and times. We have several models that are available for purchase online. All other models must be purchased in store according to Baby Lock rules. With every machine purchase, you also become a member of our V.I.P. Gold Club and receive a card entitling you to 10% off all regular-priced, in-stock fabric and notion purchases for one-year. In addition, you will receive a no risk 60-Day Trial of Baby Lock's Love of Knowledge Membership. Our Baby Lock certified in-house service department offers repair & service for your Baby Lock machine. Drop your machine off anytime. Average turn-around time is 1-2 weeks.